During World War II, Mom Chung's was the place to be in San Francisco. Soldiers, movie stars, and politicians gathered at her home to socialize, to show their dedication to the Allied cause, and to express their affection for Dr. Margaret Chung (1889-1959). The first known American-born Chinese female physician, Chung established one of the first Western medical clinics in San Francisco's Chinatown in the 1920s. She also became a prominent celebrity and behind-the-scenes political broker during World War II. 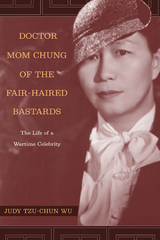 Chung gained national fame when she began "adopting" thousands of soldiers, sailors, and flyboys, including Ronald Reagan, Admiral Chester W. Nimitz, and Admiral William F. Halsey, Jr. A pioneer in both professional and political realms, Chung experimented in her personal life as well. She adopted masculine dress and had romantic relationships with other women, such as writer Elsa Gidlow and entertainer Sophie Tucker. This is the first biography to explore Margaret Chung's remarkable and complex life. It brings alive the bohemian and queer social milieus of Hollywood and San Francisco as well as the wartime celebrity community Chung cultivated. Her life affords a rare glimpse into the possibilities of traversing racial, gender, and sexual boundaries of American society from the late Victorian era through the early Cold War period. Judy Tzu-Chun Wu is Associate Professor in the Department of History at Ohio State University.